December 11, 1884: Nelle Nichols Peters, was born to a farming family in Niagara, North Dakota. She would become one of the most prolific architects in Kansas City during the 1920s and design nearly 1,000 local buildings. Despite the fact that many of these buildings still occupy prominent locations, especially near the Country Club Plaza, Nelle Peters remains one of the more obscure figures in Kansas City history. Born Nelle Elizabeth Nichols, she grew up on the North Dakota prairie until the Nichols family moved to Storm Lake, Iowa in 1899. 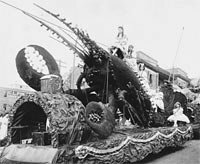 October 13, 1887: A new Kansas City tradition emerged with the first Priests of Pallas parade. President Grover Cleveland and his new bride, Frances, were on hand to witness the spectacle that would begin after nightfall. A crowd waited at the gates of the "Priests' Den," a warehouse where all of the horse-drawn floats were staged. As the doors swung open, fireworks lit the path of mounted and armored guards, the robed Priests of Pallas, and a float bearing the queen Athena, or rather, an elaborately-costumed performer. October 26, 1887: The Warder Grand Theater prepared for its glorious debut. The product of George Woodward Warder’s ambition and financing, it was the third theater in Kansas City after the Coates Opera House and Gilliss Theater. Warder intended it to outshine the other two theaters in both size and luxury. April 15, 1889: Thomas Hart Benton, future painter and a leader of the regionalist movement in American art during the 1930s, was born in Neosho, Missouri. After showing a strong interest in art as a youth, he aggressively pursued an artistic career and eventually became one of America's most famous artists of the 20th century. As a member of a politically prominent Missouri family, Benton faced the high expectations of his father, who wanted him to be a lawyer or politician. His great-uncle and namesake was the five-term U.S. Senator Thomas Hart Benton (1782-1858), who aggressively promoted westward expansion in the first half of the 19th century. January 8, 1894: Dorothy Gallagher was born to a wealthy Kansas City family. Not content to live quietly in affluence, Gallagher gained interest in a Catholic women’s group called the Agnes Ward Amberg Club, which carried out social work in Mexican communities in the west side of the city. A sizable Mexican population in Kansas City originated in the late 1800s after the U.S. government strictly limited Chinese and Japanese immigration, which caused the Santa Fe and Southern Pacific railroad companies to hire Mexican laborers for construction of railroads in the Southwest. "Her inspiration certainly came from heaven"
May 1, 1894: Elizabeth Bruce Crogman, who in 1925 became founder of Kansas City’s Florence Home for Colored Girls to house unwed African American women who were pregnant, was born in Pittsburgh, Pennsylvania. The home functioned as the counterpart to similar organizations that served the area's white residents but denied care to young black women. Under Crogman's guidance through the 1940s, the Florence Home for Colored Girls eventually expanded to offer counseling, education, shelter, and medical care to dozens of Kansas City's impoverished black mothers and children. August 27, 1896: Elmer F. Pierson, who, with brother John, would go on to found the Vendo company and dominate the world's soft drink vending machine industry, was born. In addition to its achievements in the vending industry, Pierson's company made significant contributions to America's war effort during World War II and dabbled in new innovations in other, unrelated industries. November 25, 1896: Virgil Thomson, a future composer and music critic, was born in Kansas City, Missouri. Although he would go on to live much of his life in New York and Paris, and brush elbows with world-renowned musicians and intellectuals, Thomson always claimed he drew on the musical inspirations he learned during his childhood in Kansas City. At the age of five, Thomson began his first informal piano lessons. By high school, he played the organ for several churches, including the one to which his family belonged, the Calvary Baptist Church. He attended Kansas City's Central High School, where he grew adept at writing lyrics. In Kansas City, Thomson also made his earliest forays into the musical world, sampling such diverse forms as church hymns, popular folk songs, ragtime, and early versions of jazz. June 1, 1897: Dr. Alice Berry Graham discovered a young, ailing girl whose mother could no longer afford to care for her. She and her sister, Dr. Katharine Berry Richardson, rented a bed and supplies at a maternity hospital where they saved the girl's life. This event prompted Graham and Richardson to dedicate their careers to the treatment of children. In 1904, they established Children's Mercy Hospital, which today remains one of the nation's preeminent pediatric hospitals. Alice and Katharine Berry were born in Kentucky in 1852 and 1860, respectively. The sisters both completed high school, which was a somewhat unusual accomplishment at the time for men or women. More remarkably, Alice Berry used her salary as a school teacher to support Katharine's college studies. She received a Bachelor's and Master's degree in philosophy before earning an M.D. degree at the Pennsylvania Women's College of Philadelphia. Katharine then returned Alice's favor by working as a teacher to pay for Alice's dental education at the Philadelphia Dental College. February 22, 1899: In the 1890s the Kansas City Star campaigned vigorously for the construction of an impressive convention hall that could draw important political events, business conferences, or entertainment to the vibrant city. A large new building would surpass several smaller opera houses that hosted the cultural events of the city. On February 22, 1899, a group of Kansas City businessmen fulfilled the newspaper's vision by opening Convention Hall at 13th and Central Street, built at the cost of $225,000.